➚Bernhard Lichtenberg was born in Ohlau (Silesia) on December 3, 1875. 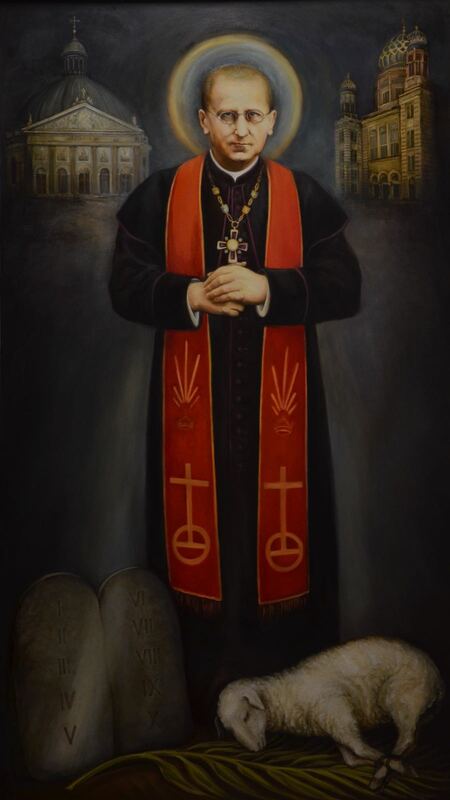 An exemplary, pious priest (1899), Cathedral Parish Priest (1932), and Provost of the Cathedral Chapter (1938), he worked tire­lessly and fearlessly in pastoral ministry and Caritas in Berlin. He was arrested by the Secret State Police (Gestapo) on October 23, 1941, for publicly praying for the persecuted Jews and for criticizing the “euthanasia” murders and then found guilty by a special court on May 22, 1942. Seriously ill after two years in prison, he died in Hof on November 5, 1943 while being transferred to the Dachau con­centration camp. Pope John Paul II beatified him as a martyr in Berlin on June 23, 1996. Today, Blessed Bernhard’s grave is located in the crypt of St. Hedwig’s Cathedral, Berlin. We are called upon to view, judge and respond to everything in the light of eternity. Blessed Bernhard, pray for us.